satisfiedcoinsandstamps has no other items for sale. 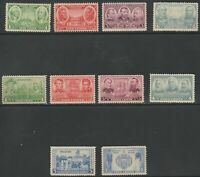 Details about SCOTT #'s 785-794 ARMY-NAVY SET, MINT, OG, NH, GREAT PRICE! SCOTT #'s 785-794 ARMY-NAVY SET, MINT, OG, NH, GREAT PRICE!